Ailbhe Ní Gearbháin, Laura Nic Dhomhnaill, Ciara Ní Dhéagánaigh, Emer Ní Ghearbhain, and Donal Gearbháin of Finscéal, Gaelcholáiste Chomáin. Budding entrepreneurs from Gaelcoláiste Chomáin in Ros Dumhach competed in the Údarás na Gaeltachta - Clár Comhlachta 2018 national final, which was held in Furbo in Galway recently. 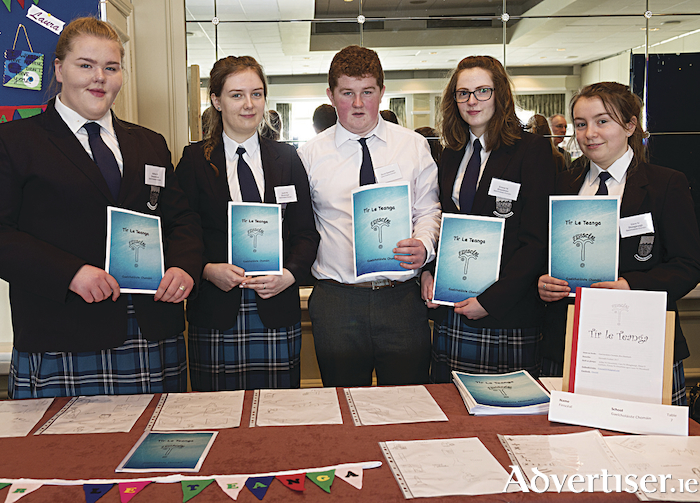 The school saw two different projects make it through to the national finals, with the first project Finscéal - an Irish grammar book for children attending primary school, which is aimed at helping them with their Irish as they prepare to enter secondary school. This was put together by the team of Laura Nic Dhomnhaill, Ciara Ní Dhéagánaigh, Ailbhe Ní Ghearbháin, and Eimear Ní Ghearbháin. The second project DCM saw students Jason Ó Muirithe, Micheál Herbert, Ml T Ó hÉilí, Brendán Ó Dochartaigh, Ryan Ó Conghaile, and Donal Gearbháin produce a customised range of craft products from wood and metal. Both companies were mentored for the competition by local business volunteers - Fiona Togher, from Carne Golf Links, and Seán Ó Coisdealbha, Údarás na Gaeltachta. However, it was not to be for either team in the finals, with the winning company Boue Cosmetics from Pobalscoil Ghaoth Dobhair, Co Donegal. The company produced face masks made from peat moss and claim to be the first face mask made from peat moss for the beauty market. It also contains a unique mix of aloe vera, jasmine tea, and eucalyptus oil scientifically proven to benefit the skin. Clár Comhlachta is developed and delivered by Údarás na Gaeltachta and Junior Achievement Ireland (JAI ). Students create, operate, and manage their own business as they move from the idea generation stage, to finance, production, marketing, sales, right through to going to market. Local business volunteers, each of whom is recruited, trained, and supported by JAI, mentor the students alongside their teachers. All participating students enjoyed a communications workshop on the eve of the final, with each team exhibiting at a trade stand, displaying their business acumen during the judges’ interview and presenting their business ideas on stage in front of a public audience on the day of the final.